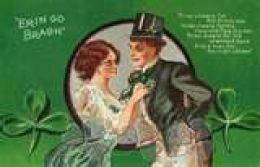 When Irish Eyes Are Smiling: Is It Really An Irish Song? Happy St. Patrick’s Day! 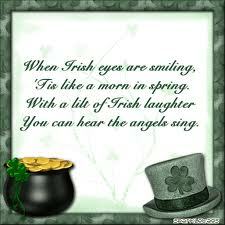 When I go to the nursing homes to do music this time of year the most requested song is When Irish Eyes Are Smiling. I was suprised to learn that it was not a song from the country of Ireland. When Irish Eyes Are Smiling is a tribute to Ireland. The lyrics were by Chauncey Olcott and George Graff, Jr. The duo teamed with Ernest Ball, who wrote the music. The song was written for an Olcott production titled The Isle O’Dreams. The song was first published in 1912. The Isle O’Dreams premeried at The Grand Opera House in New York on January 27, 1913 and closed on February 22 of that same year. Olcott actually sang the song in the production. At that time he was a famous Broadway Star. All of these men were American born, although Olcott’s mother was born in Ireland. I’m sure hearing her share stories about her childhood led to him developing a love for the country. He was also the lyricist for My Wild Irish Rose which he wrote in 1899. When Irish Eyes Are Smiling became popular among the American’s. It became an anthem for St. Patrick’s Day. The song has been used in over twenty-five movies and recorded as singles or on albums more than 200 times. It was also the opening for the radio program Duffy’s Tavern. So as you sing the song today, you can tell your friends about the origin of the much loved song. And your eyes sparkle bright as can be. So now smile a smile for me. Like the linnet’s sweet song, crooning all the day long. Comes your laughter so tender and light. With never a pain or regret.